When I select text in PDF file in Preview it doesn't highlight properly. I mean it's not about highlighting words or something, that works. But when I select text to copy it, it doesn't highlight although I can copy it and paste somewhere. Text is selectable, and it used to work like week ago, but now it doesn't. Any ideas? If I understand your question..
You can customize it by selecting Other then choose the color and how dark you want it by moving the slider. This bug also affects Microsoft PowerPoint running under Mojave. If the highlight color is set to "Graphite" you may not be able to see the text highlight and the text selection cursor will disappear. Any other highlight color seems to work. 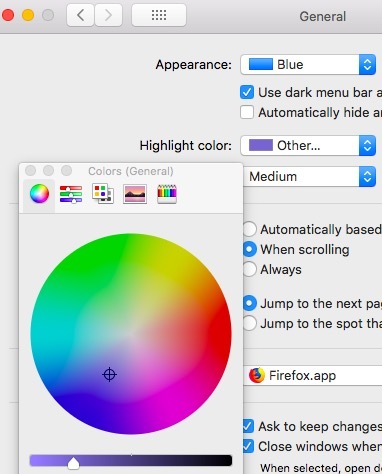 To change the highlight color, go to System Preferences > General > Highlight Color. In the Preview app on your Mac, go to the PDF page you want to change. The Text Selection tool may not beselected. Click the Show Markup Toolbar button, then click the Text Selection button. The text might be an image instead of actual text. You can’t select the text in this case. Issue is still in Mojave 10.14.3, not technically a bug. It's taking the color you select and then lightening it by a fixed amount so that it's not so dark that you can't see your text. When graphite is selected the amount it lightens the selection nearly completely offsets the color. (It's very slightly visible if you have sharp vision.) If you want a darker gray selection highlight, choose Other, then move the sliders to black and you'll get the Graphite gray you wanted. Not the answer you're looking for? Browse other questions tagged macos pdf preview . Dragging cropped .pdf file to Mac Powerpoint 2011 - Result is completely different area of original!